Byta - Blog "Team Accounts: Share, Forward, Collaborate"
Team Accounts are launching in March, compare pricing. In our post announcing Teams we explained why current sharing options for groups (of any size) are woefully inadequate, for everyone from A&R departments, to small labels and promotion companies. Pricing and features are important though Byta’s Team Accounts are about saving everyone time. Specifically time wasted deciding who’s responsible for sharing an album or track with the intended recipient(s). Then all the back and forth on which service is right for sharing in the correct format and required security settings. 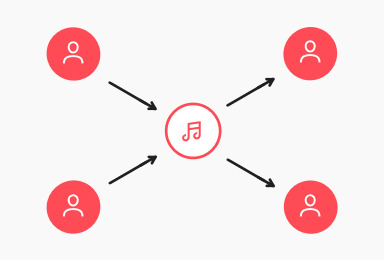 Groups of users, of any size and configuration, can access and Share audio from across their whole team, direct from their own personal accounts. Byta’s unique Forward (FWD) feature enables Team members to Forward audio to others outside their team with Share settings they control. Projects involve a web of interconnected people all over the world making their own unique contribution. Teams offer a uniquely fast, efficient and flexible way to collaborate while allowing all users complete control over their own work. This ensures each and every recipient can listen in the cleanest and simplest way, the beginning of any successful record.